Now, of course it doesn't cover everything about everything. In fact, for a lot of these sessions there was a lot more I wanted to say, but just didn't have time to say it. But hopefully it will be of a bit of use as an introductory overview. 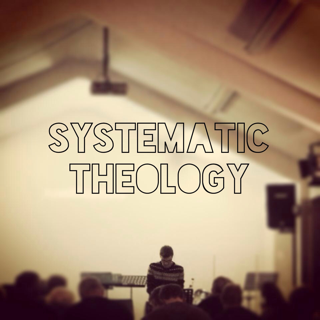 I've taught systematic theology before, but my approach this time has been a bit different. When I've taught it before (and in my experience, this is usually the case in our evangelical circles) I've rather approached it as a series of lectures on discrete doctrines. But this time I've done things a bit differently and tried to show how all the doctrines hang together (it really is "systematic" theology!). Oh, and if you're wondering, it's not so much a series of logical connections or an overarching theme that holds it all together, but Jesus. If there is a central motif running through the whole series, then (as a good Apostolic!) it's God's Eternal Purpose in Christ. That comes out most clearly in the last session which is on the Eternal Purpose, which is Trinitarian, centred on Christ and His Church, and accomplished by Christ. So those are the recurring themes you'll find the whole way through - the Trinity, Christ's Person and Work, and Union with Christ (even if the session specifically on that subject got truncated, the theme runs through many of the other sessions too). Although there are about 10 million members of the Apostolic Church around the world, we've never had a full Systematic Theology. And since the closing of our UK Bible College a few years ago, I don't know of a full course in Systematic Theology being taught within the Apostolic Church anywhere in this country. Now, this isn't a full course in systematic theology, but, given our current dearth, hopefully it will be a useful introduction for some people. Some of these sessions I'd love to completely rework (especially session 2). Others I'd just like to add some more material to. And someday I'd really love to give you a full Systematic Theology. But that's a massive undertaking, and we could be doing with a little bit of theology now. So here's my (far from perfect) humble offering. Session 1: Who is Jesus? All twelve sessions are on the Audio page (see the tabs at the top of the blog), so you'll always be able to find them easily enough. Praying that God would use them elsewhere, as He has with some of the people in Castleford, to help people see how wonderful Jesus is, to love Jesus more, and to want to learn more about our loving Triune God and His great salvation. Oh, and in case you ever make it to the conclusion of the last session, here's the picture I was talking about. 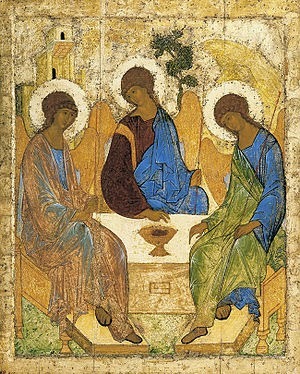 It's Rublev's Icon of the Trinity. [P.S. Teachers are a bit like magpies, gathering together all sorts of good ways of communicating our subject from all sorts of places. None of us can ever remember where all a pedagogic tools come from, but to give credit where it's due, let me just tell you where two that I consciously use in this series come from.